When I started coming up with ideas for my Camp Mom Summer project, I honestly didn't think we would be able to complete more than one full week of kids activities. Surprisingly, we managed to complete 6 weeks already and my kids are loving it! There were so many fun kids activities this week and my kids declared it the best week of Camp Mom so far! 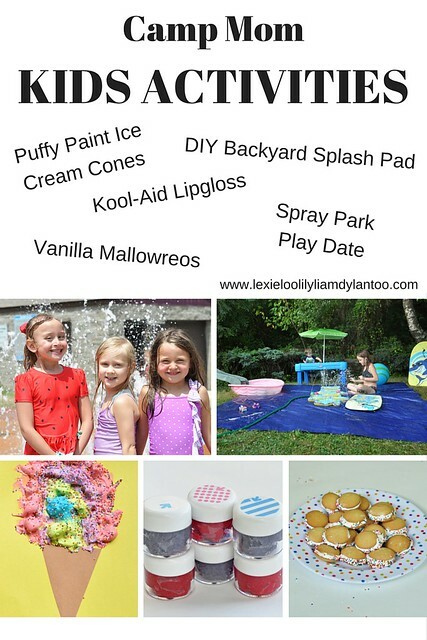 The girls whipped up their own Kool-Aid lipgloss, we beat the heat with a play date at the spray park, Lexie created a vanilla mallowreos recipe (FYI-she named them! 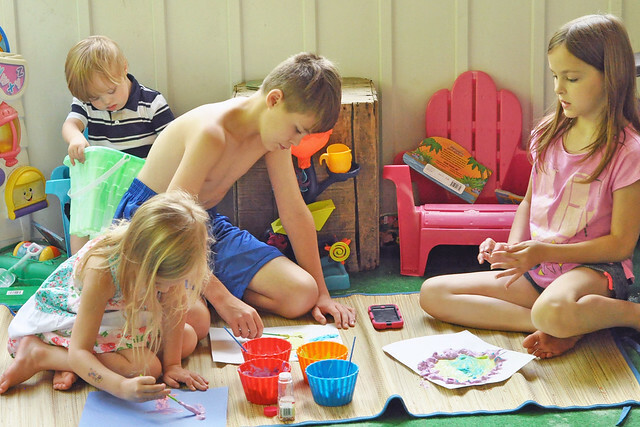 ), we set up our own DIY backyard splash pad and the kids made adorable puffy paintings. It really was a fun week! We did have one fail, though! We originally put a backyard foil river activity on our schedule and ended up replacing it after a fail of epic proportions. Even heavy duty aluminum foil didn't hold up. After 3 incredibly frustrating tries, we gave up and opted for a DIY backyard splash pad, instead. That was MUCH more fun! My girls are a bit obsessed with lipgloss. They definitely get it from me! 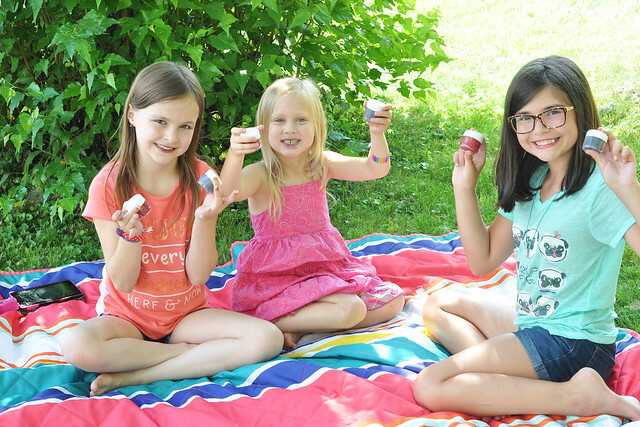 Lexie has been asking to make her own lipgloss for months, so we bought a few supplies and we finally completed this easy project! Divide the amount of Vaseline you will need to fill your jars between 2-4 bowls. 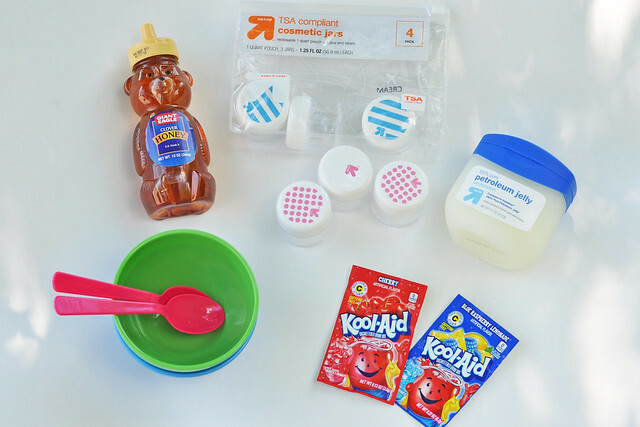 Empty a Kool-Aid packet into each bowl. Add a few drops of honey (for flavor) to each bowl. Carefully spoon the mixture into each jar. This was a quick and easy project that the girls were able to complete on their own. 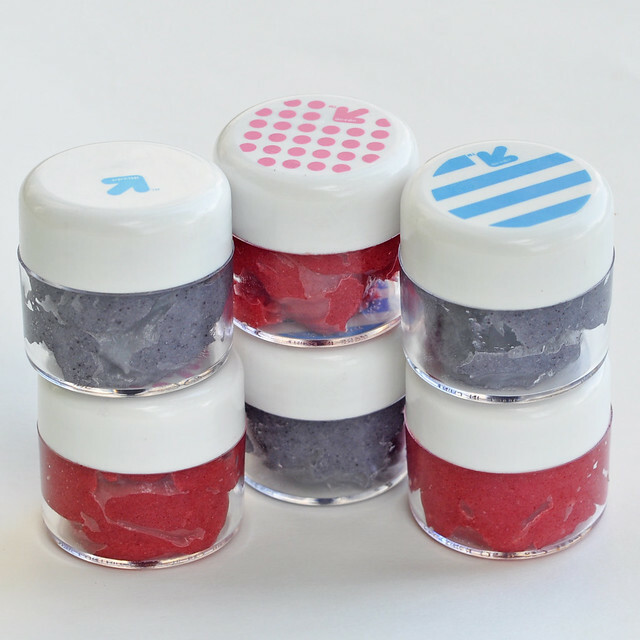 The jars are reusable so they will be able to make another batch and refill their jars in a few weeks! 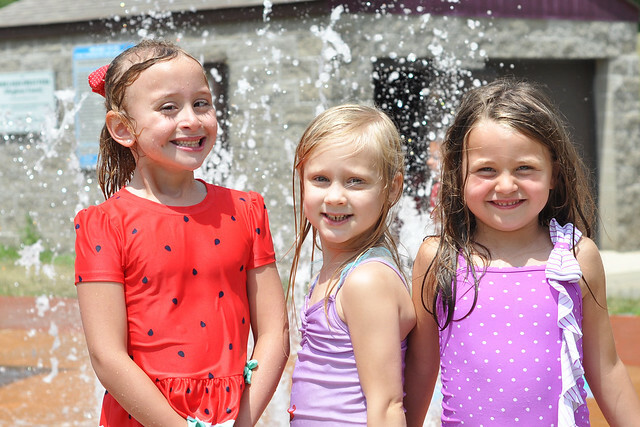 When the weather heats up, head to a local spray park! There's a great one about 25 minutes away from our house and it's free. 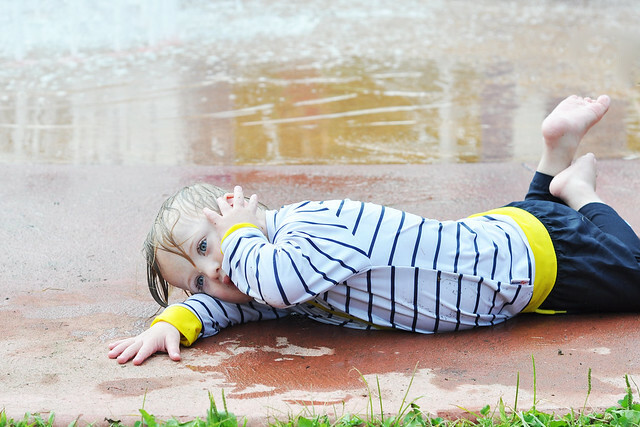 We love to meet our friends at the spray park for play dates! We had a great time at the spray park, but I'm going to save all those pictures for another post! This was a really simple idea that turned out to be a lot of fun! My kids were occupied for hours! No instructions needed! 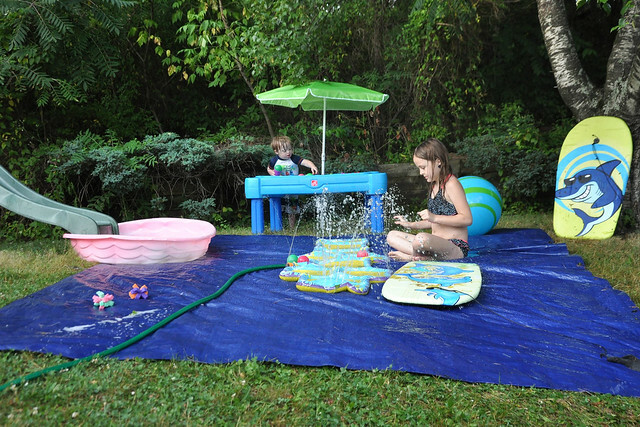 Just put down a large tarp in your backyard, gather up your outdoor water toys (pool, sprinkler, water table, etc) and set them up on or around the tarp! Make sure you place the sprinkler in the middle because that's what turns the tarp into a giant slip and slide! 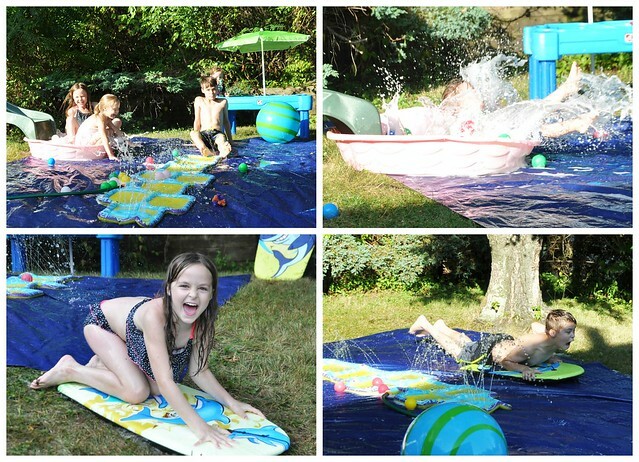 We opted to place the tarp next to the slide, so we could put the baby pool full of bubbles and balls at the bottom of the slide. It was a great way to spend a Summer day! 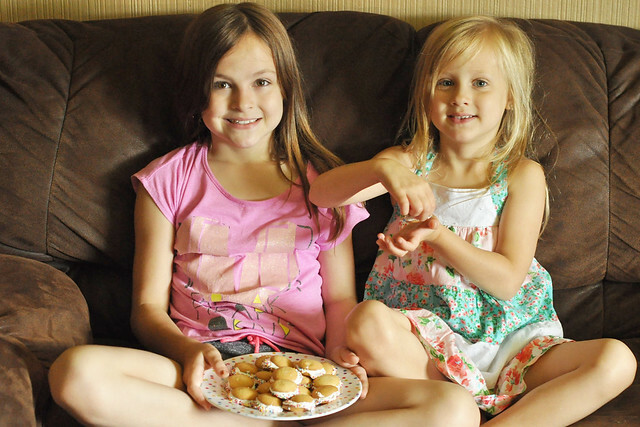 Lexie loves to bake and she's always concocting simple no-bake recipes on her own! When she goes grocery shopping with me she always picks up a few extras for her concoctions. She came up with an idea for a sandwich cookie using vanilla wafers and marshmallow fluff and it actually tasted really good! She lovingly dubbed this recipe Vanilla Malloweos, because she said it tastes like a vanilla wafer version of golden Oreos! 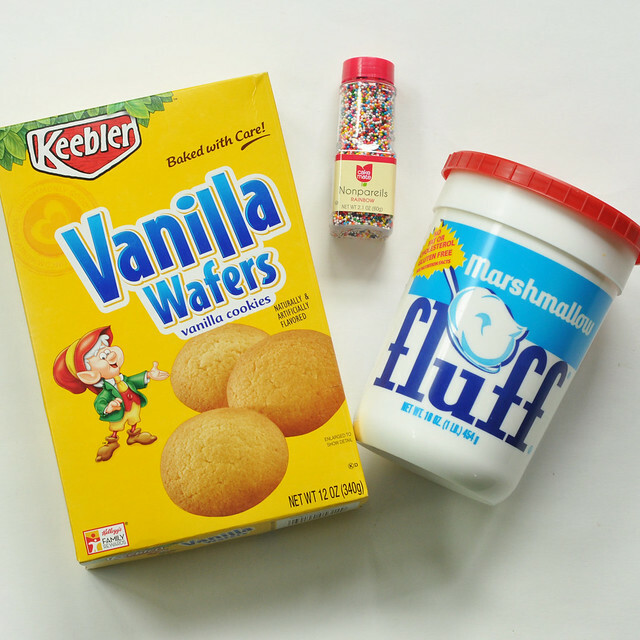 Place a glob of marshmallow fluff on the bottom of a vanilla wafer. Place another vanilla wafer on top to make a sandwich. 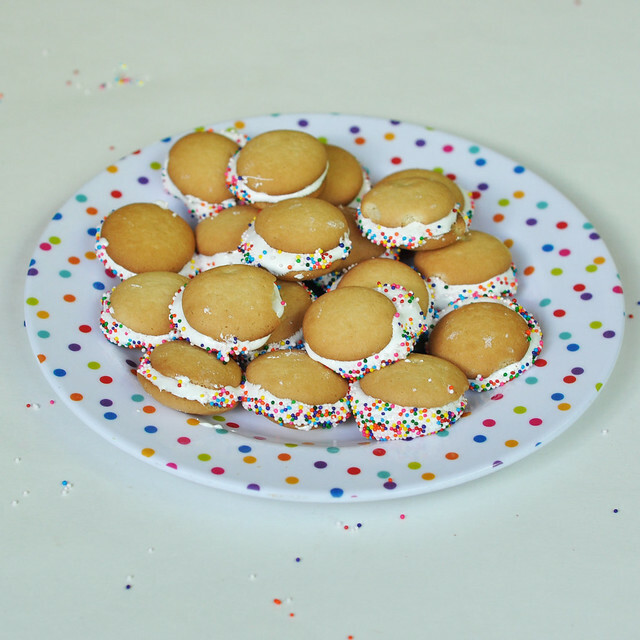 Empty the sprinkles onto a plate and gently roll the outside of the vanilla wafer sandwich cookies in the sprinkles. Mom Confession: I'm secretly hoping that Lexie takes over the cooking one day! My kids are huge fans of puffy paint! It's such a simple recipe that leaves behind the softest texture after it dries. 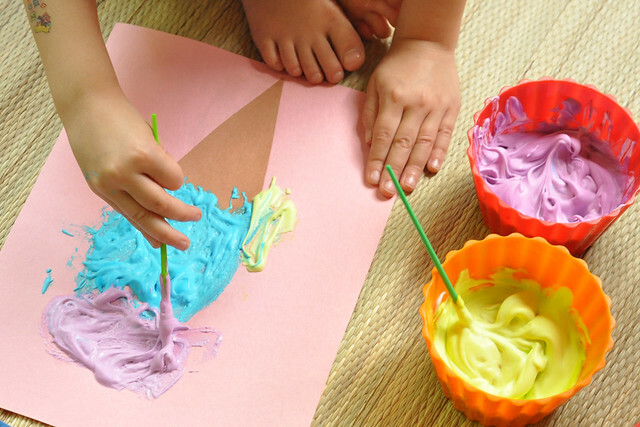 Painting with Puffy Paint is a fun sensory experience! Mix equal parts glue and shaving cream in the bowls. 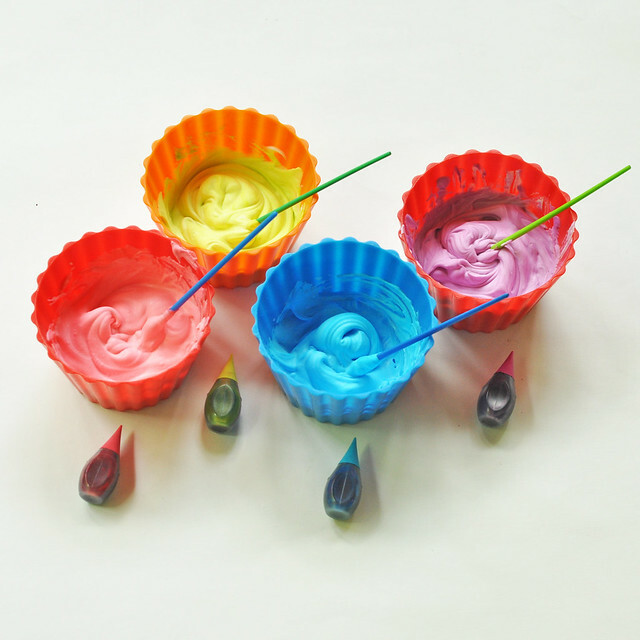 Add drops of food coloring to each bowl and mix. 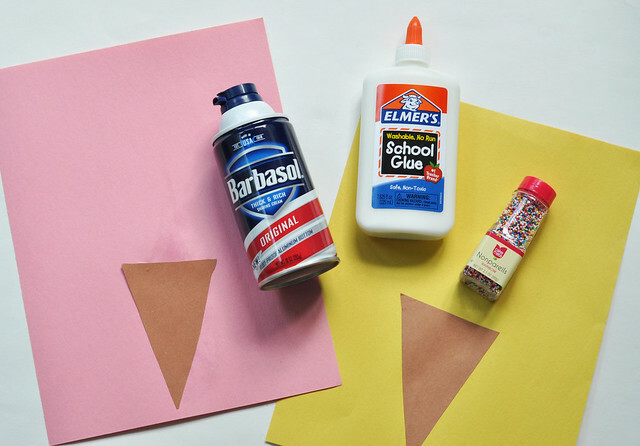 Glue the brown construction paper cone onto the sheet of construction paper. 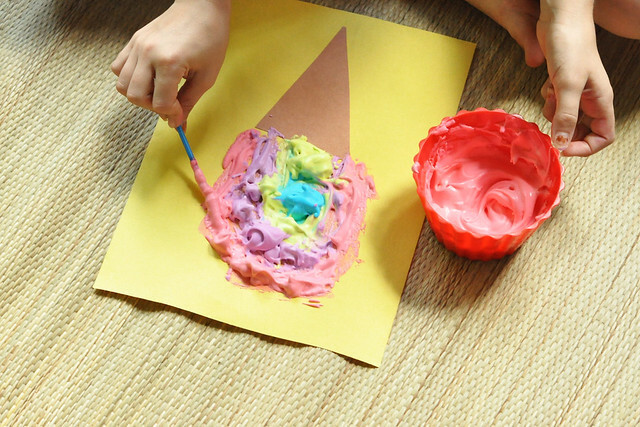 Paint the ice cream on top of the cone. Shake sprinkles all over the puffy paint. A sure sign that kids love this activity? My too-cool tween actually joined in! That, my friends, is how we rocked Camp Mom this week! What activities are you doing with your kids this Summer? So cute, as always. I kinda want to attend camp mom myself :P.
Love, love, love everything! You do the most fun things with your kids and I love it. I wish work didn't consume the majority of my week so I could do all of this stuff myself! So fun! Thank you so much! XOXO I'm sure that's tough but I know you make the most of your time off! I love that you're doing this. I have Mommy Camp coming up here in a few weeks! I may borrow some ideas! Thank you! You definitely should! I highly recommend the puffy paint craft! Thank you! I bet they would love it! Kool-aid lipgloss?! You are officially the coolest mom ever! And that icecream craft is so stinking adorable! Awww, thank you! XOXO They definitely loved that one! You are just the coolest mom! I love this. I just got another little sprinkler thing so I think we'll be rocking the back yard water by the end of this week! Girlfriend - all of this is amazing! How do you do it?! 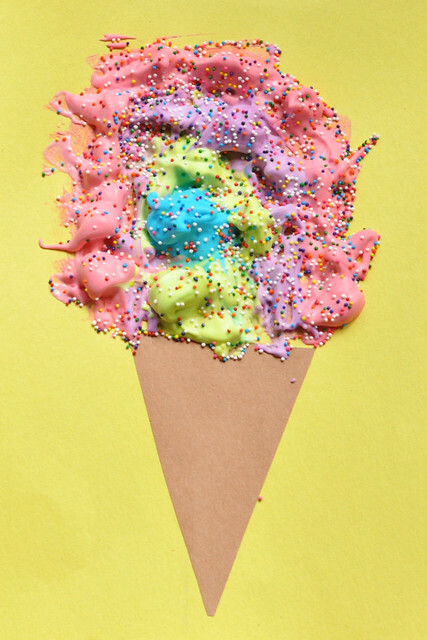 Those puffy paint ice cream cones - oh my gosh, we'll be making those ASAP! We LOVE that craft! Enjoy! Girl, you have to be the funnest mom EVER! Kool-aide lip gloss?? I would have thought I had died and gone to heaven to make something like that as a little girl! The girls loved it! I tried not to make our crafts gender-specific but Dylan isn't into crafts anymore and Liam isn't quite ready, so we'll definitely be making more girly things! Thank you so much, Jessica! Those are definitely a hit!